First, the platform on which the cars are built are good indicators of how much the technology has advanced. 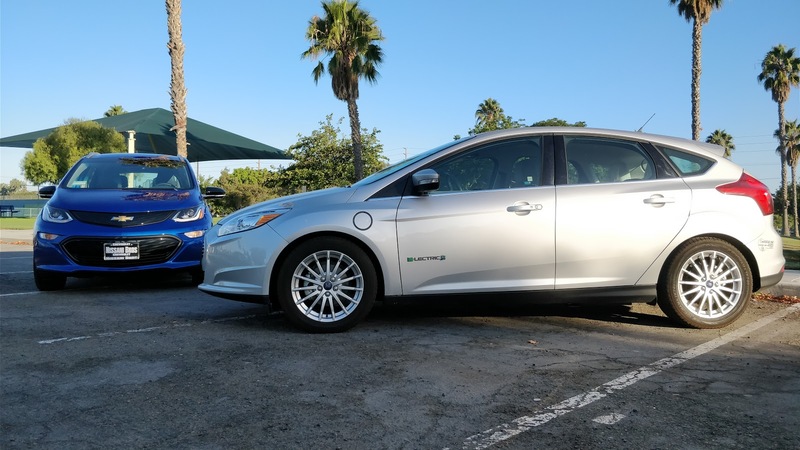 Ford opted at the time to take an existing platform and adapt it for EV service. That entailed packaging the battery into the existing space and resulted in a very compromised cargo area. While Nissan's Leaf was an early adopter of a dedicated platform, pretty much almost every other battery EV also used existing platforms adapted for EV use with varying degrees of compromised space. 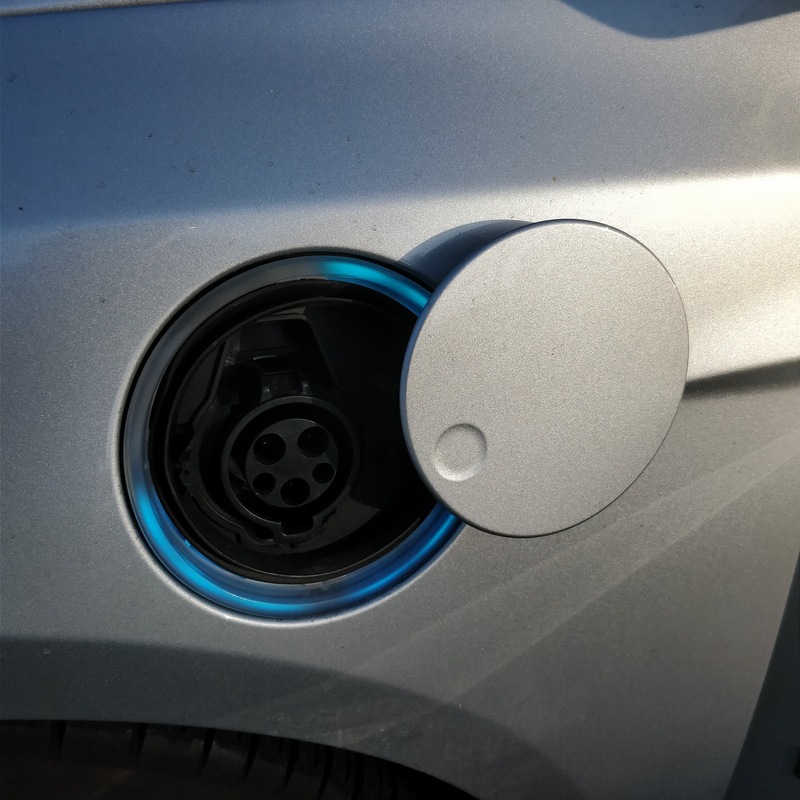 Nowadays, most battery EVs going forward will either be on dedicated platforms like that used for the Bolt EV or on platforms that have been designed with EVs in mind. No more forcibly adapting a gas burning cars to EV service, which will mean no more compromises. A big part of the platform adaptation is the battery design. Despite sharing a manufacturer, the two batteries show how much the technology has advanced in a relatively small amount of time. 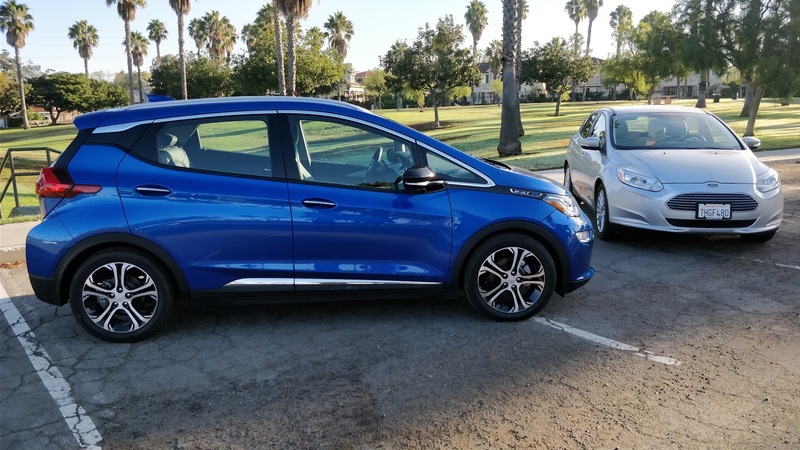 Even though they are both lithium ion, the Bolt's battery is a more advanced nickel-rich lithium ion pack that is able to withstand greater operating temperatures and costs 1/4 as much per kWh when compared to the Ford's. 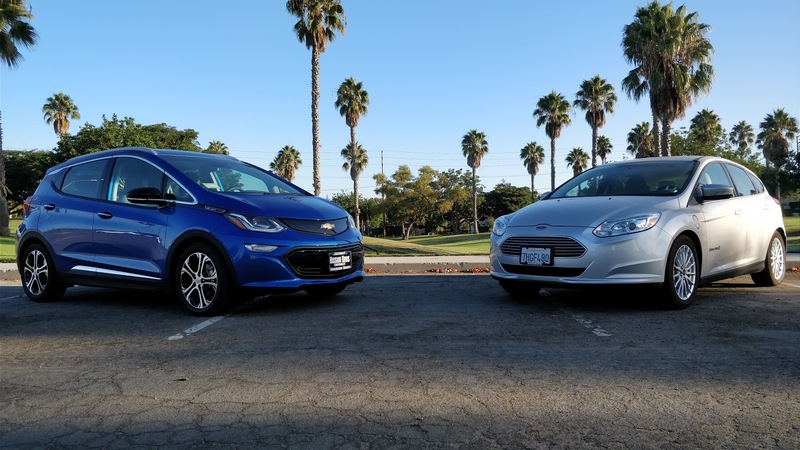 That is why the 23 kWh battery pack of the Focus originally cost nearly $13,000 whereas the Chevy's significantly larger pack comes in at a significantly less $9,000. That dramatic reduction in cost and the continued use of liquid cooling shows that batteries will only get denser and cheaper as time goes on, hopefully meaning the over time, EVs will start to be able to more fairly compete against their fossil fuel counterparts in price. Of course, the platform and battery are not the only things that have advanced. 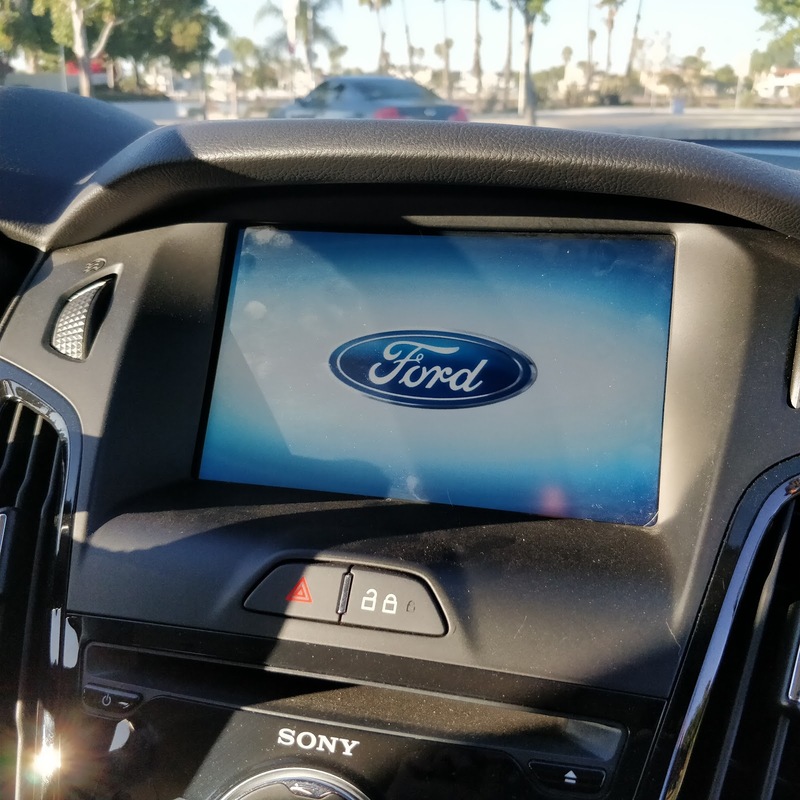 During the intervening three years, the infotainment technology has advanced by leaps and bounds. 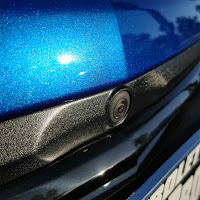 Where the Sync system in the Focus feels rather rudimentary, with its smaller screen and slightly less crisp graphics, the Bolt impresses with its large tablet-like screen and sharper graphics and cleaner user interface in the instrument cluster. And where the Sync system has built-in navigation with rudimentary voice recognition, the Bolt has chosen to incorporate the cellphone driven Android Auto and Apple CarPlay systems, relying on the ever increasingly powerful mobile devices to power the navigation capabilities and incorporating each operating system's voice assistants. Some may find the disappearance of the navigation system to be a step back, but given how infrequently I used navigation compared to the other features, if feels like a step in the right direction since I still have access to navigation when I need it and I have greater choice in which app provides my turn-by-turn directions. Other technology has also becoming increasingly available in the three years, with the Bolt sporting forward collision warning cameras, blind spot monitoring, lane keep assist, a high resolution camera rear view mirror, and a surround view camera. Add to that available DC fast charging, these are all technologies that were not even options on the Focus in 2014. 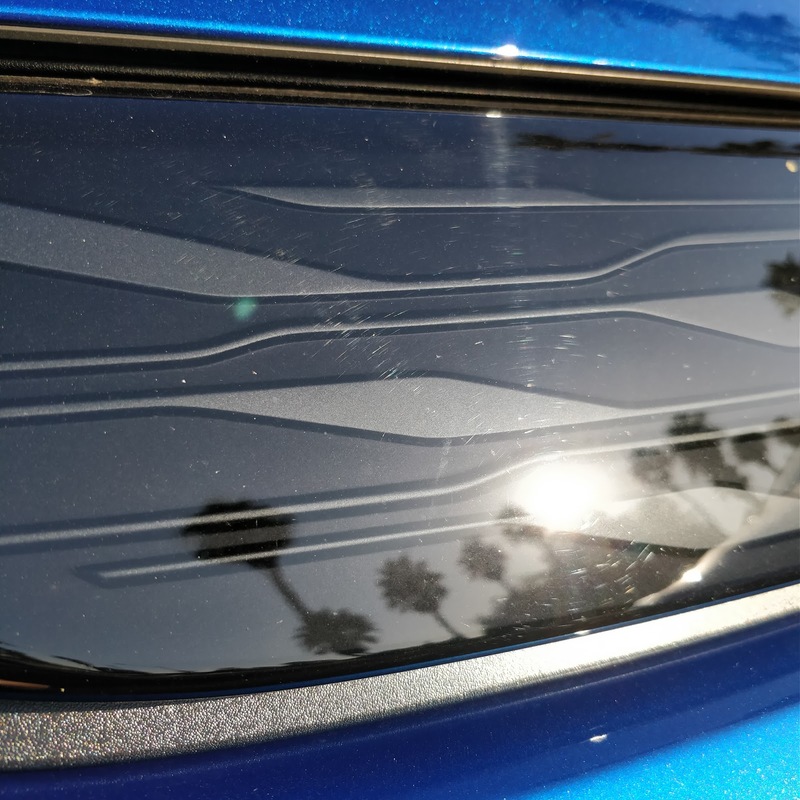 While the most recent version of the Focus has advanced a fair amount on its own in the last few years, the Bolt is still available with a variety of options that the Focus simply does not offer. Another area that has changed significantly in the intervening three years is straight-line performance. The Bolt is damn quick, capable of a 0-60 run in about 6.5 seconds. That is fully 3.5 seconds quicker than the Focus, which dawdles to the same 60 mph mark in around 10 seconds. The staggering difference is illustrated most vividly when the two cars are run side-by-side. My brother and I took a few passes in an empty parking lot and each time the Bolt was solidly 2-3 car lengths in front almost the entire way of the approximate eighth-mile course. That significantly greater acceleration translates into a much more relaxed driving experience since as a driver, I never feel like there is a lack of power. 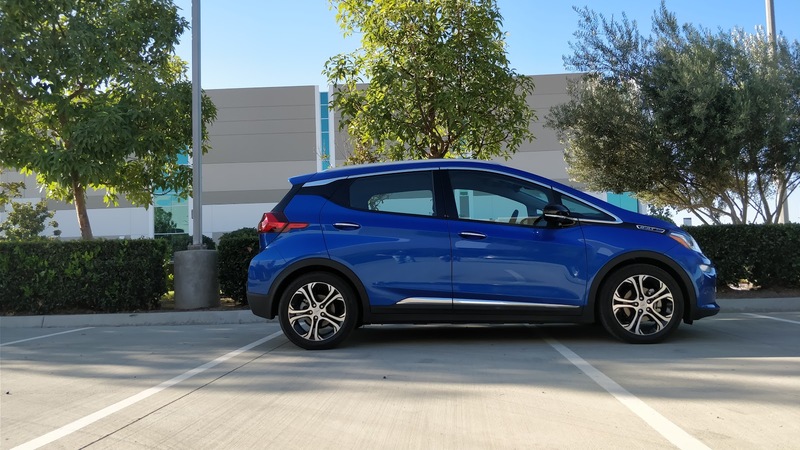 No more needing to plan passes on the freeway or full throttle freeway on-ramps since the Bolt's extra power is available at all speeds. The difference in acceleration is downright shocking and makes the Bolt the quickest EV this side of a Tesla. However, surprisingly, the Focus handles better. A big reason for this is because Ford's decision to place the battery where it is in the Focus resulted in the car have a near perfect 50:50 weight distribution. 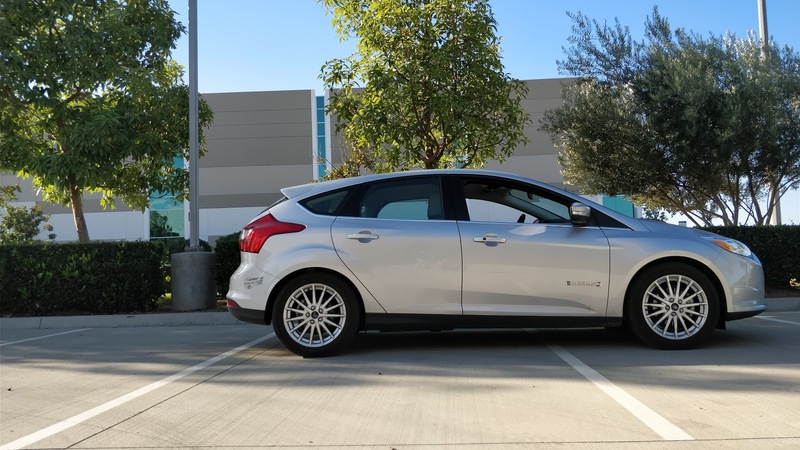 That resulted in shockingly neutral handling in corners and combined with the heftier steering feel, the Focus just feels more planted and requires less effort to corner quickly. The Bolt, while not a bad handling car, does carry a bit more weight up front, resulting in a bit of understeer and despite a quicker ratio, the steering lacks feel and is artificially light at points. For tackling a windy back road, the Focus is definitely more enjoyable to flog, but as daily drivers, either car is quite suitable. Inside, it is no contest as the Bolt feels cavernous compared with the Focus. Some find the Bolt's seats a bit tight, but I have no problem with them at all and I actually find the seats more supportive than the Focus's wider buckets. 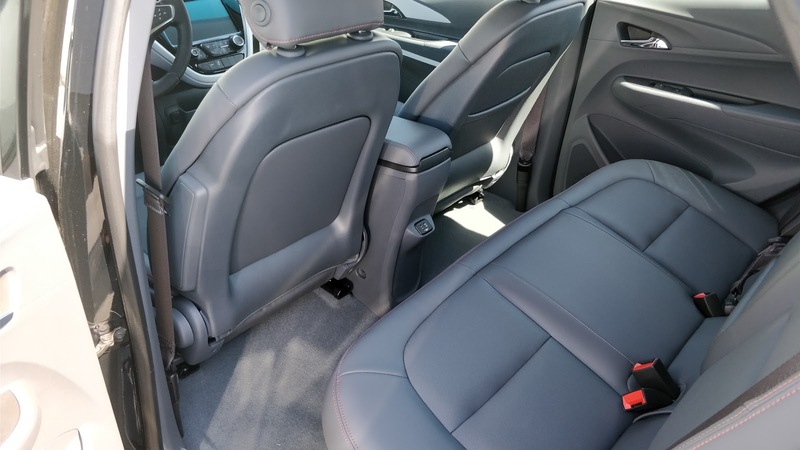 In the rear, the amount of legroom available in the Bolt simply puts the Focus to shame. 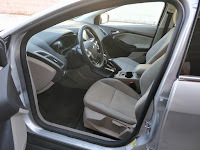 I never found the rear seat of the Focus confining, but I am comfortable enough in the Bolt's rear seat that I have used it as a mobile office a number of times. Cargo space is also greater in the Bolt, due in large part to the Focus sacrificing a big chunk of the cargo space to house a part of the battery. And that takes us back to the benefits of a dedicated EV platform. 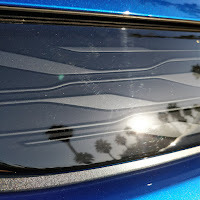 By simply targeting its platform to serve the EV specific market and designing a car around that platform, GM has been able to create a car that is a lot of things to a lot of people. For us, it is a comfortable freeway cruiser, voluminous grocery getter, capable weekend dog transport, and a quick enjoyable daily driver. While it is not without its faults, most notably its dorky appearance, it represents a significant upgrade in so many ways from the Focus. 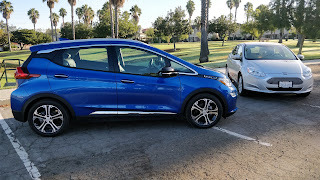 Those considering an EV for the first time should absolutely take the Bolt for a test drive because experiencing it is at once eye-opening and jaw-dropping. 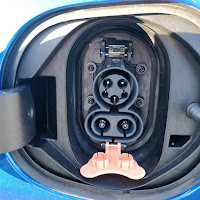 For those who already have an EV that is not a Tesla, it is worth a look simply because the enormous battery offers a chance to do away with range anxiety altogether and allows you to just get in and drive it a lot more like a regular car. And because of that, the future of the EV looks brighter than ever as I suspect more people will be willing to make the switch if they can think less about the charging and just enjoy the drive.